David lives in Castlemaine, Victoria, Australia with hot and dry summers. He is working on a simple and inexpensive and very energy efficient space cooling system that uses water cooled via radiation to the night sky. The roof spray tube and the collection gutter at the bottom of roof. 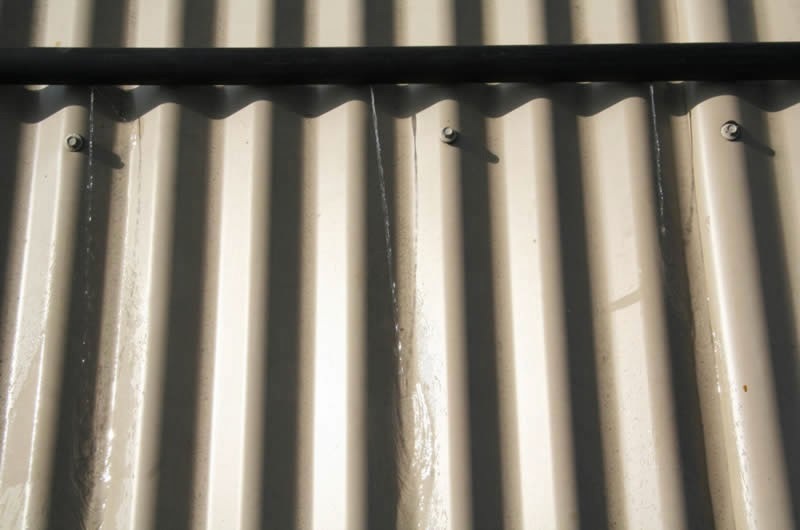 At night water is pumped from a tank to the roof where a spray tube trickles the water down the roof corrugations. The water cools by radiation and evaporation as it makes its way down the roof. 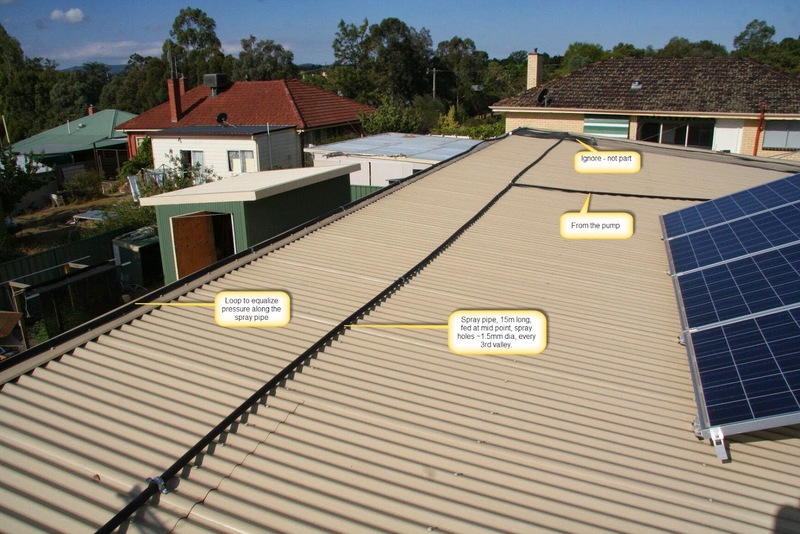 At the bottom of the roof, a gutter collects the cooler water and returns it to the tank. The next day, when cooling is needed the cooled water in the tank is used for space cooling. Closeup of the spray tube in action. Water is cooled as it flows down the roof. The "coolth" storage tank. In the final system, the tank will be located inside the living space. 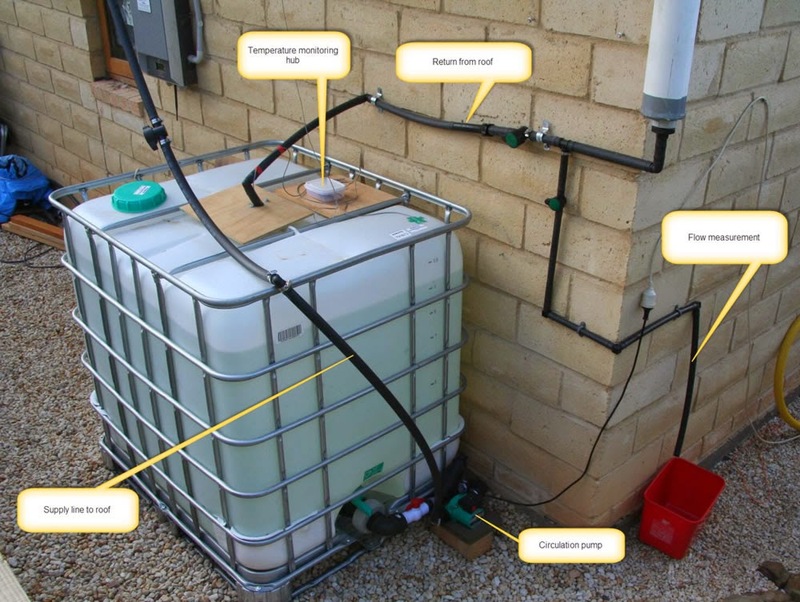 In this trial system, the tank is a 275 gallon IBC tote located outside on the ground, but in the final system the "coolth" storage tank will be located in the living space so that it can directly cool the living space.